A major crash involving a truck and another vehicle affected both sides of the 405 Freeway in the Sepulveda Pass on April 30, 2018. 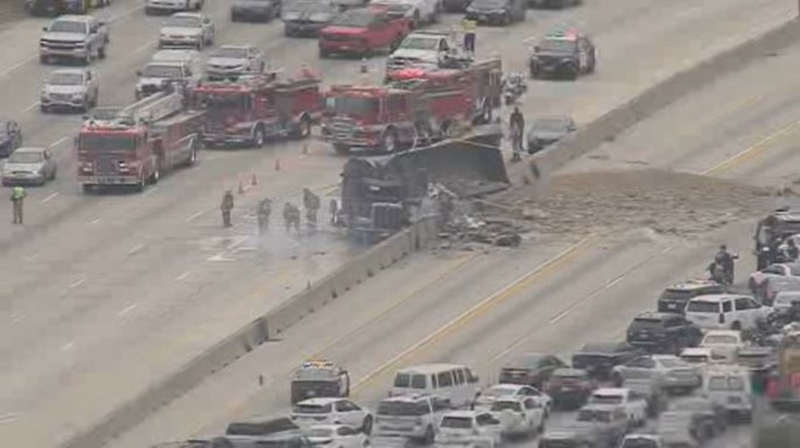 A fiery crash involving a big rig has injured three people, two critically, and backed up traffic on a Southern California freeway for miles. Authorities say a truck loaded with concrete and gravel hit a car shortly before 3 p.m. Monday on northbound Interstate 405 in the busy Sepulveda Pass area of Los Angeles. The trailer overturned on top of the car, pinning someone underneath and both vehicles burst into flames. Bystanders stopped and managed to pull the trapped person and two others to safety. However, the three reportedly suffered burns, including the truck driver. Two people were hospitalized in critical condition and the third was in fair condition. Lanes on both sides of the freeway were closed, backing up both northbound and southbound traffic.